"The Bachelor" is coming to Vermont — Manchester, specifically. 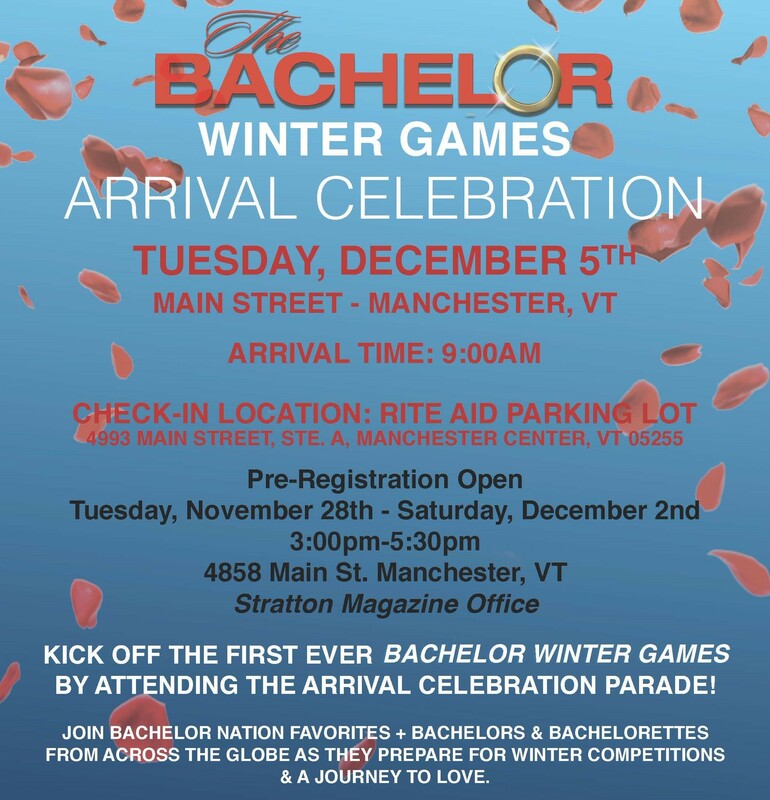 Earlier this fall, reports began circulating that ABC television would be shooting "The Bachelor: Winter Games," a spinoff of the network's hit reality dating series, "The Bachelor," at a ski resort in Vermont. Details have been sparse these past few months — including where, precisely, the show would be filmed. On Tuesday the Vermont Production Council circulated a flyer on Facebook and Twitter announcing an "arrival celebration" parade for the show. The shindig is scheduled for Tuesday, December 5, on Main Street in Manchester. (BTW, given its proximity to Manchester, the smart money would seem to be on Stratton Mountain Resort as the filming locale.) Fans of the show can take part in welcoming, as the above flyer puts it, "Bachelor nation favorites … from across the globe as they prepare for winter competitions & a journey to love." According to a report from the Bennington Banner, those wishing to join in the love journey — as spectators, that is — can register at the Stratton Magazine office in Manchester from now until Saturday, December 2. "The Bachelor: Winter Games" is scheduled to air on ABC in February.